One of the ways that a creditor with a judgment against you can attempt to collect a debt is to attach or seize your bank account. This is done by filing a third-party citation to discover assets in the Circuit Court and having it served upon the bank. Once the bank receives notice of the citation, it must freeze up to two times the judgment amount that you have in your account. Bankruptcy can help alleviate this frozen account, but it doesn’t happen overnight. The timing is critical in terms of whether or not the account can be restored and if the proceeds within the account can be returned to the debtor. When the bank citation is filed, there is what is called a return date which is a future date where the bank has to reply to the creditor as to what is being held in the account. During the time between the seizure and the return date, there is time for the debtor to file a chapter 7 bankruptcy case. The bankruptcy filing will prevent the creditor from preparing a turnover order. A turnover order is where the creditor states to the court that the bank is holding a certain amount of funds and that such amount or lesser amount should be turned over to the creditor in satisfaction of an outstanding judgment. Illinois exemption laws come into play because an individual or couple in Illinois is allowed to protect a certain amount of personal property such as funds in a bank account free and clear from creditors. In Illinois, an individual can protect up to $4000 of miscellaneous personal property known as the wildcard exemption. If the bank is holding a significant amount more than the wildcard exemption, then that additional amount could be subject to a turnover order. Filing bankruptcy during the period of seizure and before the turnover order will stop the turnover order immediately. However, the bank account does not become unfrozen overnight. The bank is going to wait for either a hold harmless letter from the debtor’s attorney or a release letter from the creditor’s attorney or a court order dismissing the third-party citation. Many bankruptcy clients are under the belief that the minute they file the bankruptcy case, that the bank account can be free and flowing once again. This is simply not the case. If the funds in the account are below the exemption amount, then those funds will remain the property of the debtor. However, it will take time before that account becomes free once again. 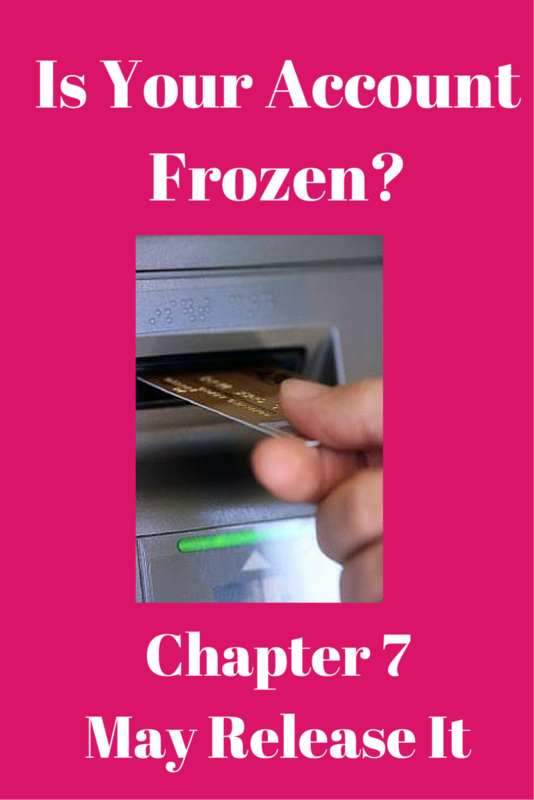 If your bank account has been frozen and you want to find a solution to release it, then chapter 7 bankruptcy could be an option for you. Please keep in mind, even after filing a chapter 7 bankruptcy, you will not have immediate access to your funds. This means that outstanding checks on automatic debits that are coming out of your account will not likely succeed. You could either make voluntary payments to those creditors in the interim or you can establish a new bank account provided you have funds to deposit. For more information on unfreezing a bank account and getting your financial house in order, contact an experienced bankruptcy attorney in your local area. If you live in the Chicago area or any of its surrounding suburbs, you may contact my office at 847-520-8100. We will let you know exactly how you can be helped.